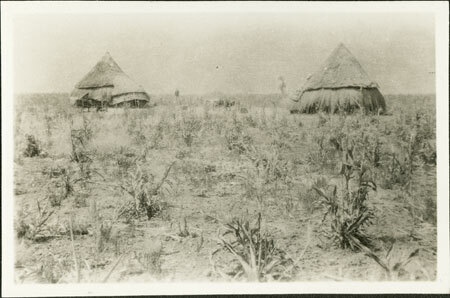 Two sleeping huts of a Nuer homestead, possibly in the vicinity of the Bahr-el-Ghazal River. They are quite elaborately constructed with extended eaves over a doorway and entrance area, and with two tiers of thatch overhanging the walls, probably of stakes either with or withour external plastering. The cattle byre (luak) belonging to the household may be out of frame, or they may have kept their cattle in a relative's byre (luak) . Note on print reverse ms pencil - "32/1 86 86 "
Morton, Chris. "Nuer huts" Southern Sudan Project (in development). 03 Jan. 2006. Pitt Rivers Museum. <http://southernsudan.prm.ox.ac.uk/details/1998.346.86.2/>.